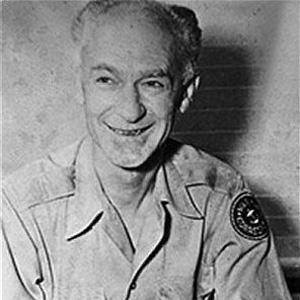 A WWII correspondent who won the Pulitzer Prize for his reporting from the front lines. He joined the U.S. Navy Reserve when he was almost eighteen, but only served three months due to the end of WWI. He was killed on the battleground island of Okinawa doing what he did best: scouting out a good story. He married Geraldine Siebolds in 1925. Charles Schulz dedicated a Peanuts comic strip to him on Veteran's day in 1997 and 1999.